Just got back from spending time 2 days with a school friend of mine. Aside from the people I’ve grown up with, I’ve been friends with her the longest, 17years! 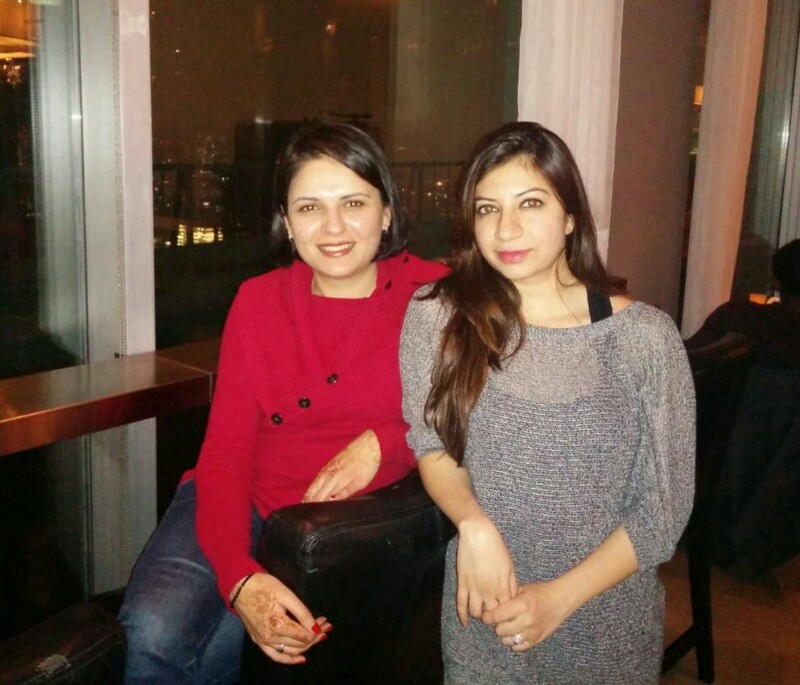 Over that time we’ve been to school together, been to the same university (but different disciplines), moved to different countries, met up in the UK, in India and now again in Canada. Somehow, wherever we are, we’ve managed to keep in touch and meet at least every 3years. So I left my cousin’s place in Ajax for Toronto, where my friend works. It was a straightforward journey; a 20 minute bus ride and then a 40 minute train ride. The plan was for me to do drop my bag with my friend and then do some sight seeing during the day and then spend the evening with my friend and her husband. Her office was a 7 minute walk from the train station in Toronto so I decided to skip wearing my hat. Big mistake. I had been struggling with a headache since the day before and it was so cold and windy that those 7 minute were enough to make my pain even worse. So I decided to skip sight seeing all together and just rest in a coffee shop somewhere. When I reached my friend’s office however she suggested I relax in the office pub instead…what?? Yes, a full fledged pub IN the office! It was an open bar with a LOT of drinks, loads of snacks (from nuts to fresh fruit to pop corn), a pool table and a TV. So the next 2 hours I spent snacking and reading and then watching the old Godzilla movie which is one of my favourites! Every now and then, someone would come by for a drink and munchies to take back to their desk! In fact, I was told that the company’s CEO is never seen without a beer in his hand. Ha. Brilliant! Wonder how much work they get done! In the evening we decided to brave the weather (I put on all the layers I could manage) and walk around the town a bit. We walked along Bay street, which is the city’s financial center, like Wall street but with only 4 banks. 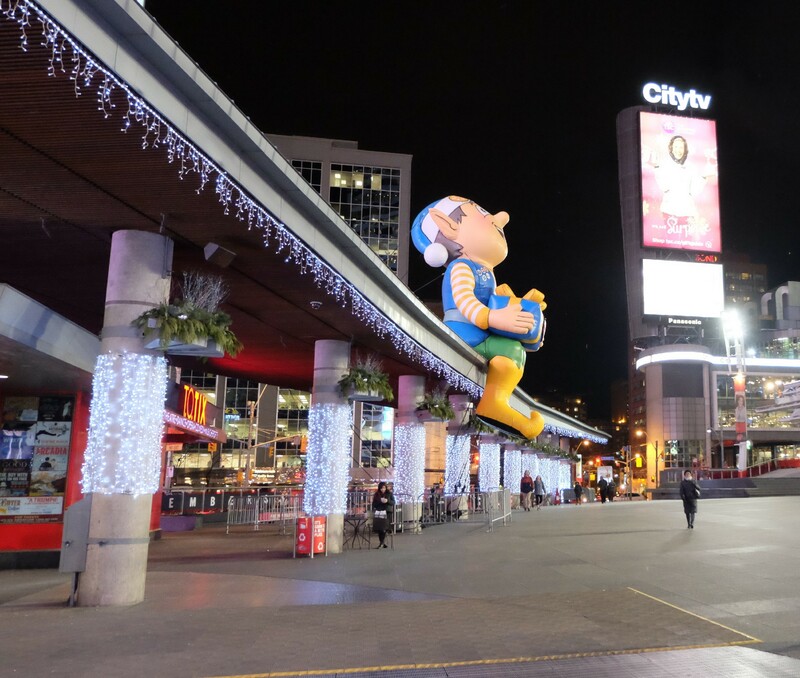 We went to the Yonge-Dundas square which is an open area that hosts numerous public events, performances and art displays and is considered a prominent landmark in Toronto. My friend called it a mini Time Square. 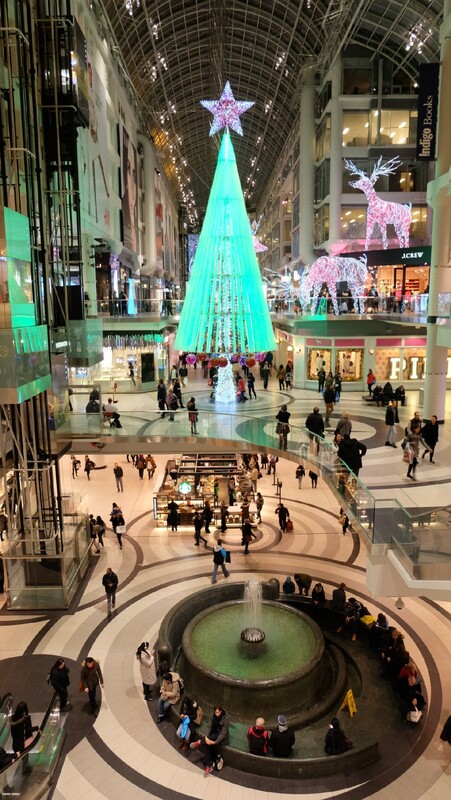 We walked through Eaton Center which is a gigantic shopping complex, a top tourist attraction with around a million visitors a week, and which was beautifully decorated for Christmas. We also walked along the PATH, which is the world’s largest underground shopping complex with 30 km (19 miles) of shopping arcades. PATH connects more than 50 buildings/office towers, twenty parking garages, six subway stations, a railway terminal, 2 department stores and some major hotels. Its provides pedestrians with a safe haven from the winter cold and snow (which I am very thankful for!) Anyways, after the walk we went back to Mississauga (pronounced Misi-saa-gaa), where my friend lives with her hubby, and got dinner at Moxie’s where I ate a delicious veggie burger with goats cheese and pesto and cheesecake (oh dear) for dessert. So what do I think of Toronto? Toronto (or Trono like I’ve heard people call it – what is with people eating up letters ?) is referred to as Canada’s NYC and in some ways it does feel like a miniature NYC. Being winter though the city feels like it is in the process of being abandoned by people. The (sort of) tall, lit up buildings and the xmas decorations inside the towers and shopping malls seems at odds with the relatively quiet streets. It feels like the city is trying hard to get people to stay but they leave nonetheless. I guess most of the people use the PATH at this time of the year which in itself reminds me of District 13 in The Hunger Games where all the activities and life is underground. Saying that though I am sure I would feel differently in the summer. The Harbour Front, the botanical gardens and national parks would completely transform this city and the warm weather would give me a chance to enjoy the natural beauty that Canada has to offer. I guess I’ll just have to come back another time.